Jollof rice – ever present. Wedding, funeral, homecoming, celebration, birth, death, life. I’m not sure what other dish has this power or magic in West Africa. Literature often mimics life so that the instances that show up on the page are likely to have happened. 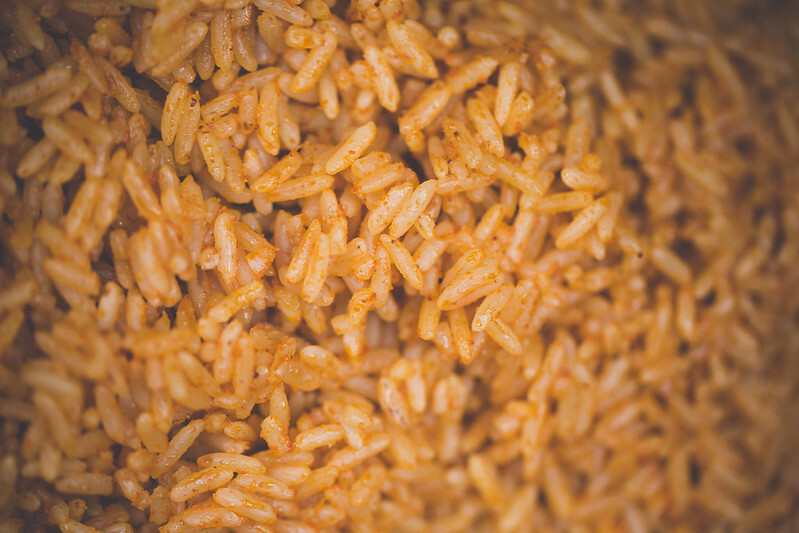 I’ve began to look out for food – particularly Jollof mentions – as I read these days. In the opening pages, Ugwu – the housekeeper cooks Fried rice for Olanna’s first visit to the house. It ends up quite the disaster – he literally fries the rice and as Olanna tries to like it but fails, Ugwu thinks to himself that perhaps he could have cooked Jollof. ‘Now, though, he wanted to cook a perfect meal, a savoury jollof rice…’ (sp – it should totally be Jollof, initial letter capitalised ’cause we need to put some respeck on Jollof’s name but back to the matter at hand) [HOAYS, page 37]. On the day Master’s mother arrived from the village, Ugwu cooked a peppery jollof rice. 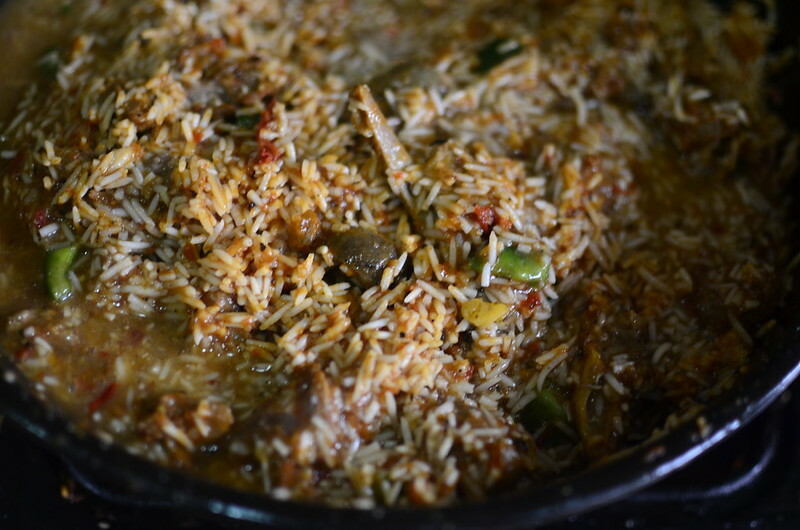 He mixed white rice into tomato sauce, tasted it, and then covered it and reduced the heat’ [HOAYS, page 119]. Mama does not eat the Jollof that Ugwu so lovingly prepared. And it hurts his feelings. ‘It irritated him: her assuming that everything belonged to Master, her taking command of his kitchen, her ignoring his perfect jollof rice and chicken [HOAYS, page 122]. I like the confidence Ugwu has in his Jollof and its abilities. In both Half of a Yellow Sun and Americanah, Jollof rice makes itself known, apparent at the beginning of a healing process, a coming to. In HOAYS, Olanna suffers from depression, the trauma of the civil war heavy on her memory. She is bed-bound for a period . Ugwu brings her food on one occasion. When she asks ‘What did you cook?’, he says ‘Jollof rice’…’I used fresh tomatoes from the garden’ [HOAYS, page 199]. In Americanah, the theme of Jollof en route healing is present again when Dike came home from a hospital stay after attempting suicide. Ifemelu makes him Jollof . ‘She made him the kind of jollof he liked, flecked with bits of red and green peppers, and as he ate, fork moving from the plate to his mouth, saying, ”This is pretty good,” as he always had in the past, she felt her tears and her questions gathering [Americanah, page 379]. Some lessons must be learned multiple times and the making of Jollof rice is no exception. It presents the perfect opportunity to learn about cooking, about trust, confidence, truth, learning all around a pot. Without a Silver Spoon by Eddie Iroh has pages on Jollof and the relationshiip between a teacher and his ward. Teacher Steve shows Ure how to make Jollof a couple of times and much is called to question – the ability to listen, what to do – lie or not – in the face of being reprimanded, and much more. Teacher also gives tips on making the best Jollof. It’s a call to timing and timeliness, knowing when one element should be added – not too early, not too late. It’s about technique, about food, about deliciousness. This section of Without a Silver Spoon has changed the way I make Jollof now. I no longer parboil the rice, preferring to soak in hot water. I must confess that I prefer the texture and it appears that I have more control on the output so my grains stay whole, flaky and separate. And maybe I’m stretching this idea of Jollof as the answer to many questions, to homesickness and loneliness, to learning but I believe in the transforming power and capacity of Jollof. And though there are many aspects to explore, let this do for now in the run up to World Jollof Rice Day.